The Handbook of Optical Constants of Solids gathers data from different papers to list the kappa values along with the wavelengths; consistency is not maintained. I show you the graph found in the handbook along with the excel plots of the absorption coefficients that my arrays are based on so the user can quickly see if the calculated value makes sense. 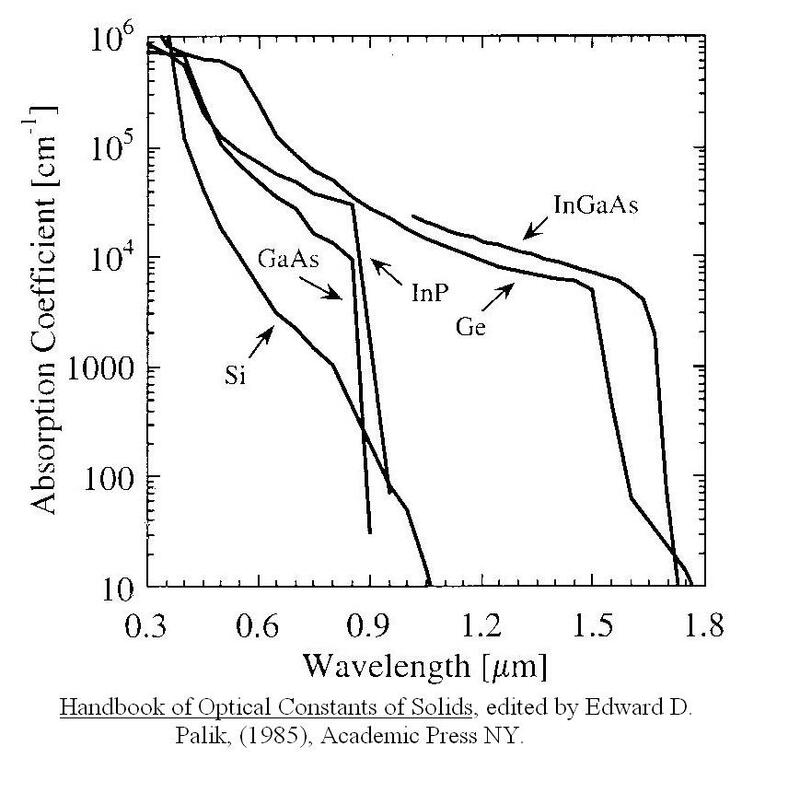 The Silicon, Gallium Arsenide, and Indium Phosphide kappa values come from a linear interpolation of data found in Handbook of Optical Constants of Solids that is found here. However, Geranium is pulled straight from the Handbook of Optical Constants of Solids and is why there are several "jumps" in the excel plot as different reported research doesn't match up. For this reason the "Warning" display is provided to inform you when you have fallen into this questionable range. The Excel graph below shows the inconsistencies of Geranium while the other graph shows the general flow of the constants. Handbook of Optical Constants of Solids, edited by Edward D. Palik, (1985), Academic Press, NY. Maintained by ECEn IMMERSE Web Team. Copyright © 1994-2009. Brigham Young University. All Rights Reserved.